iConvert Scanner for your iPhone or iPad Tablet. Note that you have too many piles of receipts, bills and other paper documents. Tame the paperwork jungle in your life by getting a scanner for your iPad® tablet. Our iConvert® Scanner captures sharp, detailed JPEG images and saves them directly to the photos folder of your iPad or iPad 2 tablet. Receipts and photos and memos, oh my! 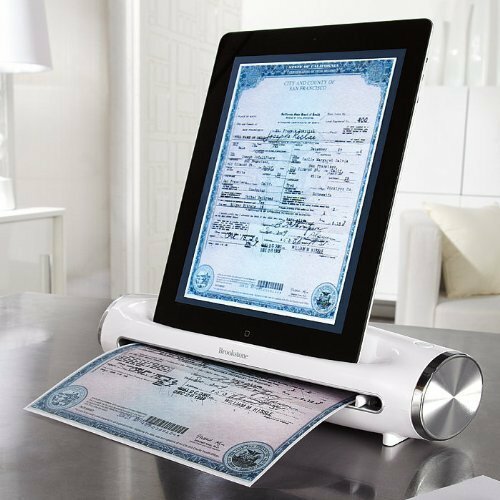 The iConvert Scanner will help you put order to-and prevent you from permanently losing-all the many types of documents in your world. At home, it lets you save family photos, genealogy records, greeting cards, recipes and children's artwork. At the office, you can archive meeting notes, resumes, renderings and signed contracts. While traveling, the scanner is perfect for digitizing receipts, expense sheets, and business cards. This compact scanner fits easily in your briefcase or backpack, measuring 12.1"w x 4.4"d x 2.8"h and weighing just 1.44 lbs. Don't risk accuracy by simply "photographing" your important documents. Cameras are great at taking pictures of people, places and things. They're NOT the best choice for capturing detailed images of documents. Using a scanner ensures that you'll be able to read every letter and number on your receipt and see every tiny detail in a photo or drawing. Shooting a document up close with a camera also frequently introduces distorted angles and unequal sharpness across the photos. By sending your document through a feed scanner, your image is perfect. iPad not included. iPad, iTunes and iCloud are trademarks of Apple Inc., registered in the U.S. and other countries. App Store is a service mark of Apple Inc. "Made for iPad" means that an electronic accessory has been designed to connect specifically to iPad and has been certified by the developer to meet Apple performance standards. Apple is not responsible for the operation of this device or its compliance with safety and regulatory standards. If you have any questions about this product by SVP, contact us by completing and submitting the form below. If you are looking for a specif part number, please include it with your message.